I've been ready for Fall for a few weeks now. but when my calendar shows "September,"
my mind automatically thinks "Fall." Things were going along smoothly too. There was a nice chill in the air. with temperatures in the 90s. can decorate for colder seasons/holidays when it's so darn hot outside. It messes with the mojo, I tell ya! Today I am happy though. Today is a sunny 70 degrees...a perfect Fall day! Autumn goodness going on around here. I feel like I've been a crafting & sewing fool lately. with the dining room chalkboard. I think this is my favorite chalkboard design to date. than when I first began. are you getting ready for Autumn, too? Your chalkboard is wonderful! It's only in the 80s here today and it's really making me ready. Roast in the oven is smelling yummy too. Love your chalkboard, Gina! I'm in full Fall mode. September 1st is always my date! The house is done, the pumpkin candles are burning and the temp is in the upper 80's...lol! You did a terrific job on the chalkboard! Love it!! Not yet. But will be soon. I love what you have written on the chalkboard...and you are off to a terrific start. I usually don't start anything fall~like until much later but my mantel and living room really scream summer and I think we need to tweak that a bit! SMILE! Love the chalkboard!! Nice job!! Okay, so right off I went to my fahrenheit to celsuis converter and smiled.... it is so relative to where you live, isn't it? 70 degrees feels like a wonderful extension to summer in my part of the world. I love fall but it always seems so short, often I buy fall mums and they freeze. :( But, silly me will probably buy them again so I can get that fall feeling around my home. What a wonderful chalkboard and saying, Gina! I have been inside decorating because the heat and humidity have been terrible. Autumn has definitely arrived in the house! Nice job on the chalkboard! 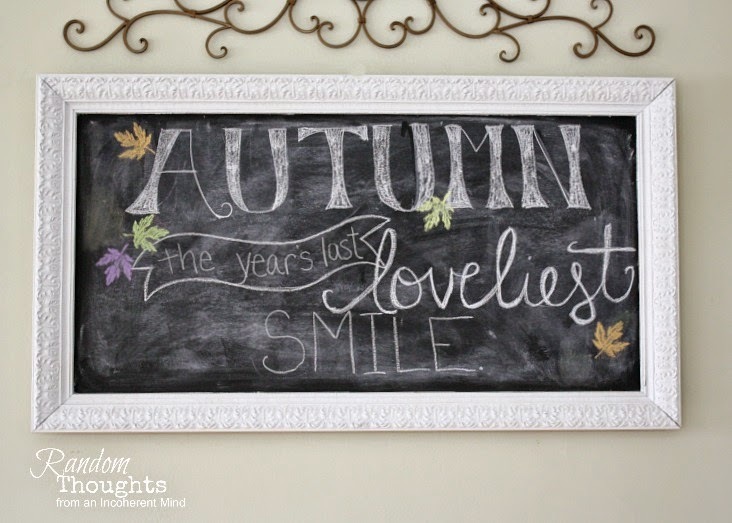 Isn't it fun to design a new chalkboard sign for Fall?! It's been warm here too... but that hasn't stopped my from enjoying this Fall season, one second. To each their own I suppose, but around here, Fall everything reigns supreme. You know me Gina, I am ready for Fall come August. I love your chalkboard. I look forward to seeing your home soon decked out. Well, I'm one of those girls in the southern climes, and I do indeed struggle with it. When September comes,I just make sure the AC is blowing and decorate inside the house. I don't try to do the outside until the end of the month at the earliest because well... you know. I love your chalkboard. I have long wanted one, but I am NO ARTIST at all. Sigh. The chalkboard is so sweet -- you did a great job! I AM one of those very warm climate people, and if I waited for cooler temps, it would be November before I did any decorating. My feeling is that we have to fake Fall anyway, so why not start as early as we want. I have things staged to decorate my outdoor entry, but it's still too hot -- hot glued items tend to fall apart as the glue softens and begins to melt. It's not a pretty sight! Can't wait to see your Fall decor! Love the chalkboard! Last week it was 80's and humid (ugh) but this week it's finally feeling like fall. Cooler temps and it's dark at 8pm! I got my first spice pumpkin latte and put out my decorations. As long as it doesn't get hot again I'll be happy. But you know how New England is? Things change so quickly! : ) Your chalkboard looks adorable! I can't wait to see more of you autumn decorations! Gina, We are still having temps in the high 90s here in Florida. I love decorating for Fall but my neighbors will think I am crazy if I start putting out pumpkins now. Love the chalkboard. Nope, not ready for Fall, still great beach days here. Fall will come, I am enjoying summer! Love the chalkboard!!! I need a chill in the air to get myself motivated to make the fall switch. We've certainly had many of them this week.. last night it was in the low 50's. Brrrrr.